Coaster Photo: Bradley Beach resident Mark Bozzo is a member of the Knights of Columbus Motorcycle Ministry. When one thinks of the Roman Catholic men’s group, the Knights of Columbus, one may think of members collecting money for charity on roadsides or dressed in ceremonial costumes of cape, hat with ostrich feathers and sword. But riding motorcycles? 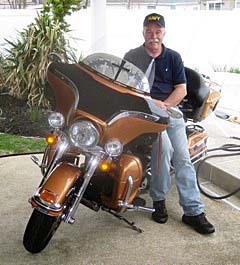 In New Jersey, the state Knights of Columbus Motorcycle Ministry has existed since 2008, said Mark “Bozz” Bozzo of Bradley Beach. Since June, the 61-year-old business owner — he owns New Jersey Retractable Awnings in Wall — has been president of the approximately 180-member state ministry. This ministry is just an extension of Knights of Columbus work. “We just do it on motorcycles, this is another tool for us for membership,” Bozzo said. Last year, according to Bozzo, the Motorcycle Ministry raised an estimated $18,000 to $20,000. The money went to Special Olympics New Jersey for mentally disabled athletes, about $10,000; dementia issues, “a few thousand” dollars: and other money going to various community causes. Recently, a businessman donated $5,000 to the ministry for Special Olympics, Bozzo said. “How we affect the places we go to is easy to feel. It’s priceless,” he said. Bozzo joined the Knights of Columbus in 2008, or shortly after the motorcycle ministry was formed by Knights in Middletown. Bozzo, a motorcyclist since he was about 17-years-old, attended a blessing of motorcycles at Holy Innocents Church in Neptune and learned of the group. The 180 Knights belonging to the Ministry are about evenly divided between the North and South Jersey chapters, with the Raritan River the line dividing the regions. Before taking over as state president in June, Bozzo was president of the South Jersey chapter. Three priests, according to to Bozzo, belong to the Motorcycle Ministry. With 65,000 Knights in New Jersey, there seems an untapped membership to join the Motorcycle Ministry, Bozzo said. Bozzo and his wife, Dawn, are active in their church, Church of the Ascension in Bradley Beach. He is the cantor and children’s choir director. Dawn is a lector and Eucharistic minister. Bozzo also is the state chair of Knights programs and deputy grand knight of Knights Council 816 in Neptune City. As for the Motorcycle Ministry, Bozzo said, “What keeps me there is this commitment from other men, who have been Knights longer than me, makes me want to hang with them. Anyone interested in the New Jersey Knights of Columbus Motorcycle Ministry can telephone 908-349-1882 or email Info@NJKofCMM.com. The website is www.njkofcmm.com. Posted in Shore Communities and tagged Bradley Beach, Joe Sapia, Shore Communities. ← What do you look for at garage sales?